It shouldn't be a surprise to any of you that vegetarian dinners are a given in my home. I have many recipes posted here that feature beans as the primary protein or pastawith vegetables as the main course. I like meat. We eat meat. But, we don't eat meat very often and, in fact, most of our dinners at home each week are vegetarian. I also love a savory breakfast dish for dinner. This frittata just sort of happened and I'm glad it did because it was very good. It's also easy to prepare, which is so helpful with all of the after-school fall activities that are starting to fill the calendars. Plus, the leftovers are wonderful the next day for lunch. I cooked the potatoes in the cast iron skillet during afternoon nap time. I simply covered the skillet with foil and popped it into the refrigerator once the potatoes were finished to wait until I was ready to prepare dinner. Dinner prep is then very quick. And, bonus, it's a one skillet meal, so clean up is also easy, which leaves you more time to enjoy your glass of wine. Place the potatoes with olive oil in a cart iron skillet and cook until tender and browned, about 45 minutes. At this point, you can put the potatoes in the refrigerator until you are ready to finish dinner, or immediately continue to next steps. 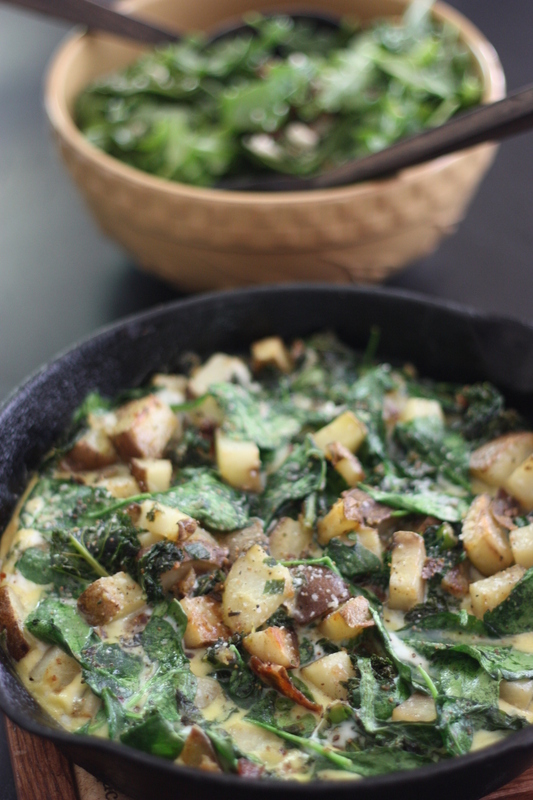 Add kale, spinach, and scallions to the potatoes in the cast iron skillet and cook over medium heat for 3-; minutes, or until the kale and spinach have wilted. Beat the eggs with salt and pepper, and pour them over the vegetables in the skillet. Cook over medium until the eggs are mostly set. Then, placd the whole skillet under the broiler, until the top is bronzed and the eggs are just set throughout, approximately 5 minutes, but this could vary due to how hot your broiler is. Let cool slightly before slicing into wedges. This weekend I'll be staying at the wonderful Sleeping Lady Resort and attending their Harvest Dinner! I'm so excited! Such amazing moves by these companies, but will employees actually utilize their awarded time off? Breast milk is an important food, but also a potent medicine for your baby. I love to think about how I'm shaping Rigby's taste preferences and also helping him fight off nasty germs. Baby spit backwash is a real thing. Thoughts on quality time. It really does make a difference if you spend more time than just having dinner with those you love. I love roasted chicken, but actually roasting it myself seems like such a daunting task. This recipe may have just convinced me to give it a try.